X-acto Foamboard cutter (X7747) | i can make stuff!! One of the materials I have started working with recently is foamboard. It is made up of a layer of polystyrene sandwiched inbetween two thick paper layers.It is a very lightweight but sturdy material that is structurally very stable and pretty easy to work with. I got mine in a local art/crafts shop but its pretty cheap online too. Its best cut by using a sharp blade and running the blade along the cut line three times. Once to break the first paper layer. Second to cut through the foam layer and third to cut the second paper layer. By taking advantage of the integrity of the second paper layer until the third cut is made, you can make some interesting cuts and incisions to achieve different joining mechanisms. I will talk more about these in a different post. There is a difficulty in cutting at 45 degrees however. Due to the thickness of the foamboard, you often need to make 45º cuts for neater joints, especially at corners. Looking on Youtube, a lot of folks are using specific foamboard tools, usually the ones from Logan. I tried sourcing some of these but they were quite pricey to get locally and even when getting them online, they were still rather expensive. I tried making the 45º freehand but they were uneven and gave a poor finish. So, in true cheapo style, I decided to make my own. I had some scrap pieces of foam board that I had been using to test paint interaction with the foam itself. Using these and some pins, I attempted a crude angled holder that was designed to work with one of my cutting blades. In steps the Xacto X7747! Its cheap enough on Amazon (approx €7) and the reviews aren’t too bad. Nothing stellar but not one star level either. Its designed to allow for 45º and 90º cuts although I have only used it for 45º so far. As the depth has to be set manually, it is too cumbersome to constantly be adjusting for the different lengths required for 45º and 90º cuts. There are guide marks but I found them to be two imprecise and ended up doing test cuts after every change to make sure i wasn’t going to run through the second paper layer. I tried using it as shown in the video but I found I was able to get better results by setting up the cutter as described for left-handed use but to use it with my right hand. I would measure back 25mm from the line I wish to cut, place the straight edge of my ruler along that new line, and run the cutter along the straight edge. This overcomes one of the flaws in the tool which is the short length of the angle adapter. Another downside, is that the blades are not the standard Xacto blades. It requires 8R Utility Xacto blades which are harder to find and more expensive. Given the ability of foamboard to dull blades quite quickly, it is something to remember. The shape of the cutter is also a bit awkward to deal with for storage purposes and once you have your blade set to a depth that suits you may not want to change it just for storage. I put mine in a small plastic box without adjusting the blade. This allows me to store it easily in the toolbox without risk of injury due to stabbing! Would I still recommend it? Yes! If you are going to be using it for occasional use, the downsides are easily overcome and its pretty cheap. For day to day use it would probably be best to use one of the Logan tools or design your own if you are so inclined. For those who are really on a tight budget, there is the hobbyking cutter but from reviews, it seems to be a bit of a hit and miss tool. 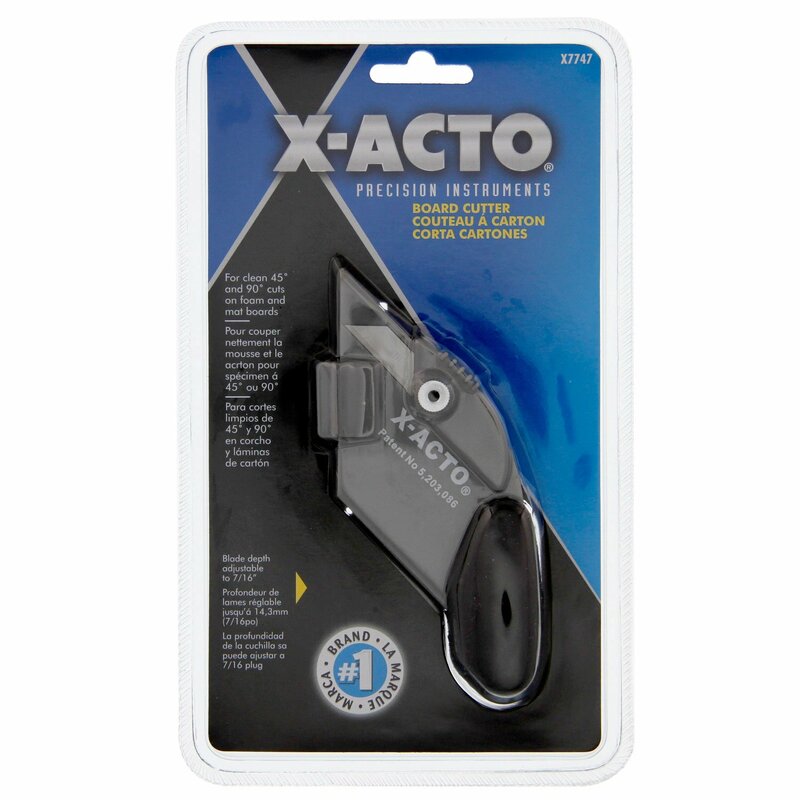 After you factor in shipping, the Xacto isn’t much dearer and the blades are even more obscure for the hobbyking tool. Maybe you have another option to reccommend? Pingback: Homemade Foamboard Cutter | i can make stuff! !